Tips: Russet or golden potatoes may be used. May be made with ground turkey, ground beef or ground chicken. Serve with additional heated pizza sauce on the side, if desired. Suggestion: Delicious served with a salad and a bread side. Potato Pizza Lasagna can also be classified as a pizza lasagna or potato casserole, and is a fun, tasty and economical alternative to traditional lasagna recipes. If you enjoy pizza, lasagna and potatoes, you'll be able to enjoy the flavors of all three with this easy Potato Pizza Lasagna! For those following a gluten free diet, this recipe can also be served as a gluten free lasagna. before placing in the oven, while the microwave method doesn't require any cooking of the meat prior to placing in the microwave. If you enjoy a golden crispy top on your casseroles, then you'll want to use the traditional oven method, though both will produce tasty results! Just as lasagna is made using layers of ingredients, this Potato Pizza Lasagna recipe also features layers, though with a few changes to the ingredients used. The layers in this lasagna recipe include sliced potatoes, pizza sauce, ground turkey (lean ground beef or ground chicken can also be used), and mozzarella cheese. A generous portion of Parmesan cheese is then sprinkled over the top. Russet or golden potatoes may be used, and the skins can be left on or peeled off, depending on your personal preference. The potato skins become tender while baking, so if you like potato skins and the nutritional value they offer, you might as well leave them on, because it will save you the time and fuss of peeling the potatoes. This lasagna recipe is very easy to put together, and produces a fun dish that appeals to all ages, offers great flavor and satisfies big hunger! Cook turkey (or beef or chicken) in skillet (if using turkey or chicken, lightly oil skillet first), stirring and breaking up to crumble until no pink is left (7-10 minutes). Remove from heat and set aside. Spray the bottom and sides of a 1-quart casserole dish with non-stick cooking spray. Scrub potatoes (if not peeling), then cut (peeled or unpeeled) into 1/4-inch-thick slices. Set aside. Spread 2 tablespoons of the pizza sauce over the bottom of the prepared casserole dish. 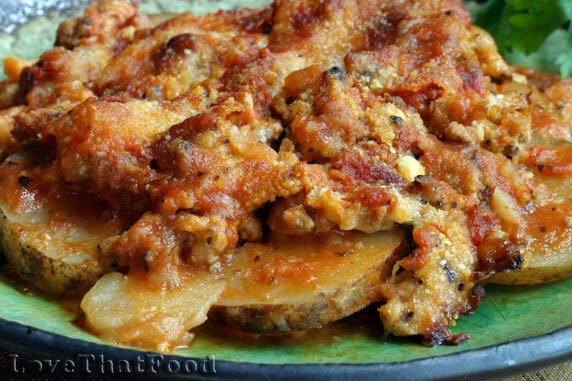 Arrange half of the sliced potatoes in a single layer on top of the pizza sauce. Crumble half of the turkey (or beef) evenly over the potatoes. Season evenly with half of the salt and pepper. Sprinkle with half of the mozzarella cheese and half of the remaining pizza sauce. Repeat the layering process with the remaining potatoes, turkey (or beef), salt, pepper, mozzarella and pizza sauce. Sprinkle Parmesan evenly over the top (a little more Parmesan may be used, if desired). Bake for 1 hour 15 minutes, covering casserole dish with aluminum foil or casserole lid for the last 30 minutes of baking, or as soon as top of casserole becomes golden and crispy (this will prevent burning on the top). Carefully remove aluminum foil and serve. Prepare Potato Pizza Lasagna using the Traditional Oven Method, only do not cook the meat in a skillet (meat will cook in the microwave), then cover casserole with plastic wrap. Microwave on high for 20 minutes (cooking time may vary depending on microwave), or until the potatoes and turkey (or beef or chicken) are done. Once cooked, allow to sit for 2 minutes in the microwave. Carefully remove casserole from microwave using oven mitts, as casserole dish will be hot. Still wearing oven mitts, carefully remove plastic wrap to prevent burns from steam. Serve.